A "thinking cap" created by Sydney University researchers claims that a magnetic coil can stimulate greater creativity and enhance other skills. In one experiment, volunteers were asked to draw a dog, horse or face from memory before and after being zapped for ten to 15 minutes. Four of the 11 volunteers produced more natural pictures after wearing the cap. Two also spotted written mistakes in pieces of text that they'd overlooked earlier, a Royal Society conference heard on Monday. In a third experiment, the device boosted the ability to quickly estimate the number of dots shown on a screen. The technique is the same used in transcranial magnetic stimulation (TMS), which has been studied on a more extensive basis for relief of depression, migraines and sleeplessness. Science fiction authors (and audiences) have been fascinated for generations with the idea of helmets that bestow remarkable abilities. "...I merely lived through the five minutes before I entered this office, in reverse order; everything happened backward. .."
The doctor was pleased. "Evidently my process worked perfectly. I call it automatic reversed memory. By sending the proper electric currents through that helmet I reverse the electrical action of the nerve cells in the brain and produce this reversed memory... as real as actual experience." "That helmet I have devised has a great number of small metal plates inside which I pick up the impulses from the various parts of the brain. They pass through the wires to my instruments and their beats, frequencies, and potentials are recorded..."
"...our forefathers originated Control. It is a device to make certain that everyone has the same mental attitude on important questions. The wisest of our race is always the Controller. He wears the sacred Control helmet, the supreme achievement of our science, which amplifies and broadcasts the neuro-electric currents of his brain as a powerful vibration that affects every other human brain, setting up the same currents, the same basic ideas, in them all." They conducted you to your couch and helped you to fit over your head a bright metal helmet which had inside it what seemed to be hundreds of tiny, extremely sharp points which bit into your scalp just enought to make you nervous, but without enough pressure to break the skin. Once this gadget, which was called a toposcope, was adjusted to their satisfaction, the monitors left, and the room began to fill with the gray gas. More recent examples from sf movies abound. 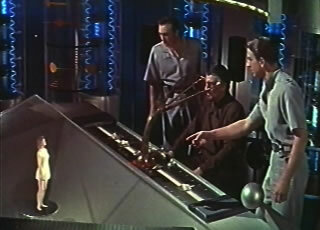 In the film Forbidden Planet, Professor Morbius gains amazing Krell secrets from brief helmet sessions. 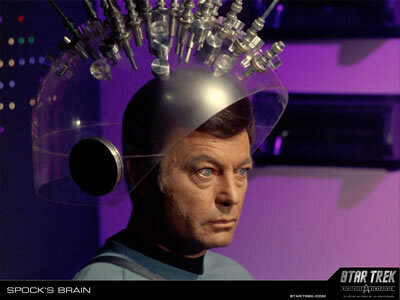 In the classic Trek episode Spock's Brain, Dr. McCoy gains centuries of medical knowledge in a single episode. From Daily Mail; thanks to Moira for writing in with this one.